If you thought Echos were only good for invading your privacy and enticing hackers, then boy do I have some news for you. Amazon just introduced a new addition to the Smart Home Skill API for Alexa: cooking. 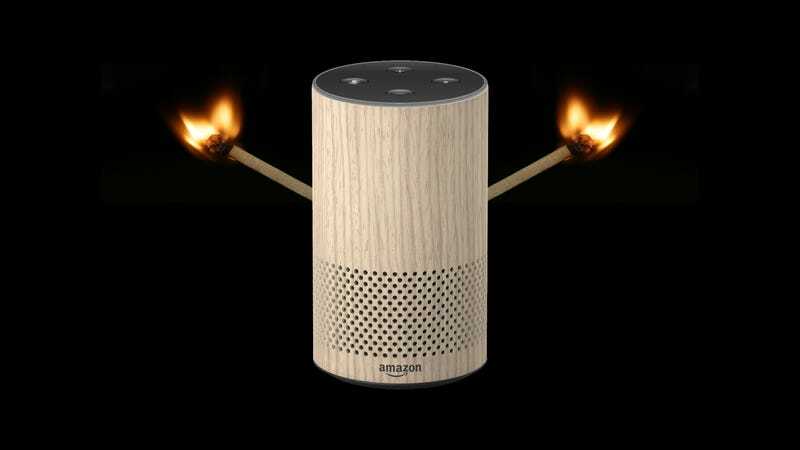 Your voice-controlled assistant could potentially be burning down your house in no time! Alexa’s new cooking capabilities sound quaint for now. In an announcement blog post, Amazon developer Mike Maas said that the first Alexa-powered kitchen appliance would be a microwave from Whirlpool with support for “other cooking devices, such as conventional ovens,” coming soon. The announcement post also links to some developer documents that offer up examples for commands that include “Alexa, microwave the popcorn” and “Alexa, cook the pizza in the microwave.” (Pro tip: never put pizza in the microwave unless you want to eat a slab of soggy rubber with cheese on top.) GE Appliances, Kenmore, LG, and Samsung will soon announce Alexa cooking capabilities on kitchen appliances of their own. Okay okay, you’ve probably learned not to put metal in the microwave by now. But can you imagine? Your kid doesn’t learn so good and then he throws a can of Spaghetti-Os in your new Whirlpool microwave and tells Alexa to cook them for, I don’t know, 20 minutes. This is improbable, but it demonstrates that a human could tell a robot to do something that would possibly cause your house to burn down. The idea of cooking with an Amazon Echo will spread beyond the microwave. Amazon says that Alexa-powered ovens are on the way, which makes you wonder about all the extra risk involved in an artificially intelligent robot controlling a machine that manipulates fire. One danger, for instance, could be the fact that Alexa controls mean physically visiting your oven won’t be necessary. How do you know that your silly kid didn’t hide his fireworks in there? Turning the broiler on to heat up a case of fireworks could also possibly cause your house to burn down. These are crazy hypotheticals, but there’s also reason to wonder how well manufacturers will deal with adding these newfound Alexa cooking capabilities into internet-connected appliances. After all, the Internet of Things is infamously and relentlessly hackable. Countless companies have also struggled with building connected gadgets that simply work like they’re supposed to. Even juggernauts like GE have a scary track record of building bad technology. One would hope that developers will build safeguards into these new Alexa cooking capabilities. One would also hope that appliance manufacturers will integrate voice-controls with caution, since the technology is so new. It’s also encouraging that the Alexa Fund invested in the June Oven, a stupidly expensive oven that also happens to be stupidly amazing. That might mean that Amazon is really taking this cooking thing seriously. You should, too. That is, if you plan on using Alexa to control your microwave and your oven and whatever else in your kitchen can deals with fire and hot, hot heat. Safety first. Impressing your guests with a voice-controlled popcorn machine second. And hey, if all else fails, just use those knobs and buttons. Humans have been doing it for decades with only a limited number of kitchen fires.